When former President Barack Obama ran his 2008 presidential campaign utilizing multi-racial coalitions, he took a page out of Tom Bradley’s political playbook. Bradley, a member of Kappa Alpha Psi Fraternity, Inc, was the 38th mayor of Los Angeles, CA. He served five terms from 1973 to 1993 and his 20-year mayoral career is the longest tenure in the city’s history. Bradley was also Los Angeles’ first and only African American mayor. He campaigned across racial and ethnic lines creating coalitions of African Americans, white liberals, Jews, Mexican and Asian Americans, which was unsurpassed until the election of President Obama. Bradley’s initiatives transformed the City of Angeles into what we know it to be today. Under his administration the city was diversified, the business and financial sectors were revitalized, and became the second largest city in the U.S. surpassing Chicago. Bradley’s innovation placed L.A. on a global stage as an international trade center, and the host of the 1984 Olympic Games, which were the first profitable Olympics in history. His accomplishments are vast and still benefit Angelenos today. Bradley reformed City Hall opening city commissions and board positions to women, minorities, and the LGBT community for primarily the first time in the city’s history. Born in Calvert, TX in 1917, Bradley’s parents were sharecroppers and his grandparents were slaves. His family moved to Los Angeles when he was seven years old. Bradley excelled in track and football and earned an athletic scholarship to UCLA. During his matriculation, he crossed Kappa Alpha Psi’s Upsilon Chapter. He served as the 18th Grand Polemarch for the fraternity from 1964-1967. Bradley began his professional career with the Los Angeles Police Department (LAPD) when very few African Americans were on the force. He spoke out about the injustices within the department and rose through the ranks to become the first black lieutenant. In 1961, Bradley retired from the LAPD and earned his J.D. from Southwestern Law School. His political aspirations blossomed in 1963 when he was elected councilman of the city’s 10th District. 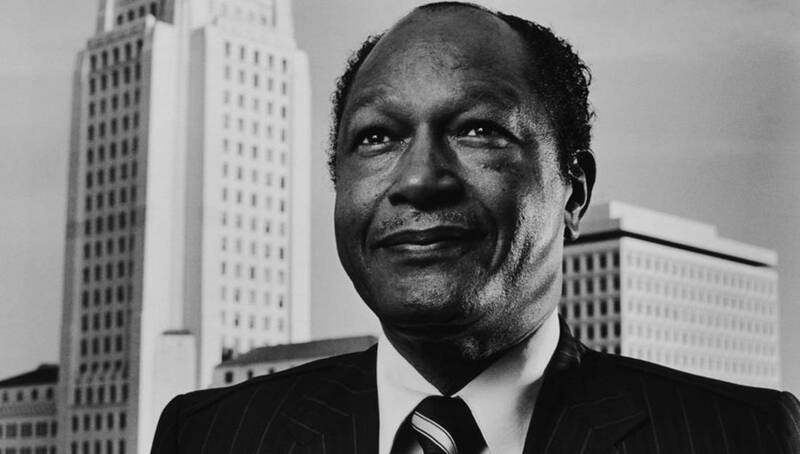 He was the first African American elected to the Los Angeles City Council. Bradley passed in 1998, but his legacy is forever prominent on a daily basis within the city he transformed; from the expansion of the Los Angeles International Airport (the international terminal is named after him); the existence of the Downtown skyline; civil oversight and reform of the LAPD; and the light rail system, which has since evolved into Metro rapid transit, his imprint on the city of Los Angeles is forever vibrant and present. Share this on Facebook if you think this piece of history needs to be shared.